Whether curled up on a sofa with a good mystery, lounging by the pool with a steamy romance, or brooding over a classic novel, Americans love to read. Despite the distractions of modern living, nothing quite satisfies many individuals more than a really good book. And regardless of how one accesses that book—through a tablet, a smart phone, or a good, old-fashioned hardcover—those choices have been tallied for decades. In Bestseller: A Century of America’s Favorite Books, Robert McParland looks at the reading tastes of a nation—from the beginning of the twentieth century to the present day. Through extensive research, McParland provides context for the literature that appealed to the masses, from low-brow potboilers like Forever Amber to Pulitzer-Prize winners such as To Kill a Mockingbird. Decade by decade, McParland discusses the books that resonated with the American public and shows how current events and popular culture shaped the reading habits of millions. Profiles of authors with frequent appearances—from Ernest Hemingway to Danielle Steel—are included, along with standout titles that readers return to year after year. A snapshot of America and its love of reading through the decades, this volume informs and entertains while also providing a handy reference of the country’s most popular books. 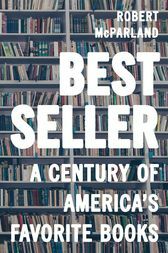 For those wanting to learn more about the history of American culture through its reading habits, Bestseller: A Century of America’s Favorite Books is a must-read. McParland serves a sumptuous feast for booklovers in this unfailingly lively, perceptive, and informative look at 118 years of best-selling books in America. Robert McParland is professor of English and chair of the Department of English at Felician College. He is the author of several books on American literature including Beyond Gatsby: How Fitzgerald, Hemingway, and Writers of the 1920s Shaped American Culture (2015), Citizen Steinbeck: Giving Voice to the People (2016), and From Native Son to King’s Men: The Literary Landscape of 1940s America (2017), all published by Rowman & Littlefield.